It looks like our city government continues to deteriorate even after we got rid of the old crew. The latest evidence is found in the auditor’s presentation to city council at their Tuesday, November 17, 2015 council meeting. 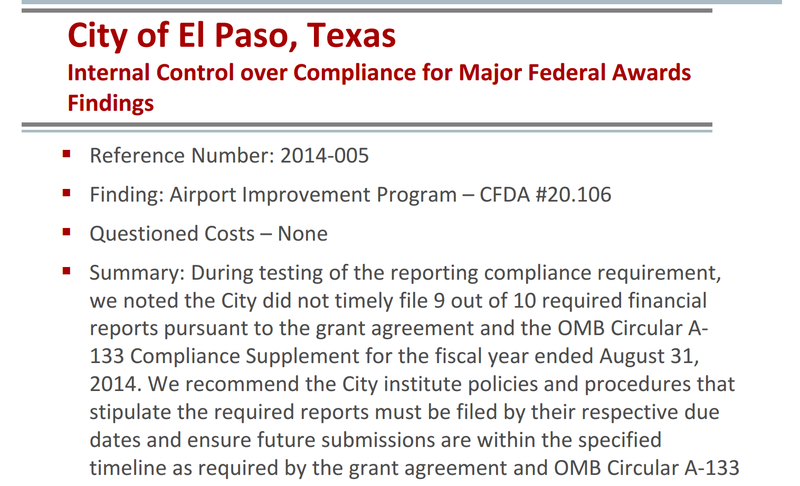 It appears that 90% of the reports the airport was required to submit under a grant agreement were not filed when they were due. We’ve been told that many of the problems at the city are because of the stupidity of the voters when they approved the quality of life bonds. We should have known that the city could not handle the extra work–at least that’s what they’re telling us now. The workload at the airport should not be affected by the quality of life bonds. Should it bother us that the airport director is now in charge of the city’s entire capital improvement department? This entry was posted on Monday, November 16th, 2015 at 5:08 AM and is filed under City government. You can follow any responses to this entry through the RSS 2.0 feed. You can leave a response, or trackback from your own site. I had to file quarterly grant reports for BTOP and initially the grant accounting office was not really on top of the game. A new manager was hired in 2013 and she was really sharp; turned the whole thing around. Our city officials don’t even know how to take free money, much less make money. Gonzalez’s Chief Performance Officer sidekick, who he brought along with him from Irving and who is making more than $200,000, should be the first to go. This also proves that all of his razzmatazz about Six Sigma is pure BS. Maybe the two of them would get more done for the city if they were less interested in doing outside consulting through their private businesses. Maybe we have a serious case of “Too Many Chiefs, And Not Enough Indians-itis” running rampant through the scattered offices of our dysfunctional government?